Lexus’s flagship LS sedan is about to get sportier. With the Detroit and Geneva motor shows now a distant memory, the next automotive exhibition on our calendar is this month's New York International Auto Show. While the long-awaited reveal of the Dodge Demon will no doubt dominate the show, other automakers are now starting to tease some of the surprises we can expect. Luxury carmaker Lexus is the latest to do so, revealing that its flagship LS sedan is about to get sportier with the debut of the LS 500 F Sport at the show, following the unveil of the LS 500 at Detroit and the LS 500h hybrid at Geneva. Rather than extracting more power, the new F Sport package will further improve the ride and handling capabilities of the LS 500. The new LS is based on the company’s GA-L platform which is the stiffest developed by the automaker yet and plays a significant part in the improved handling, smoothness and cabin quietness offered in the new LS range. 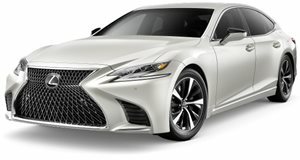 Available for both the LS 500 and LS 500h, Lexus says the new F Sport package will “capitalize on the platform’s responsiveness and agility to deliver the most engaging LS driving experience yet.” Judging from the supplied teaser image, the Lexus LS 500 F Sport will receive similar upgrades to previous F Sport models. Expect the LS 500 F Sport to feature an aggressive bodykit, a tweaked chassis with firmer suspension and beefier brakes, and a sportier cabin. Powering the LS 500 F Sport will be the same 3.5-liter V6 twin-turbo engine which produces 415 horsepower and 442 lb-ft of torque, while the hybrid version has a 3.5-liter V6 combined with two electric motors to produce 354 horsepower. While it’s possible the LS 500 F Sport will have improved throttle response for a more spirited drive, we’ll probably have to wait until Lexus releases a proper LS F model for a more substantial performance boost, if that ever happens. In the meantime, we still can’t get over Lexus’s reluctance to bring out a high performance LC F coupe.